(Newser) – Up to 30 Haitian migrants died yesterday in a doomed attempt to get out of their desperately poor homeland. Coast Guard officials say a "grossly overloaded, unbalanced, unseaworthy" sailboat carrying around 150 migrants hit a reef and capsized near Staniel Cay in the Bahamas, the AP reports. 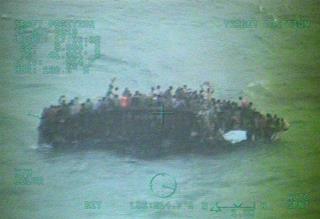 The Bahamas military and US Coast Guard found scores of survivors clinging to the hull. Some 20 bodies were recovered and the survivors—weak and dehydrated after up to nine days at sea with little food and water—were taken to a military base where they will be processed then sent back to Haiti. Haiti is a poor excuse for a country. All they can export is poverty, pestilence, disease, crime, and human parasites. Is it not a wonder that nobody but nobody wants their ilk on their shores? I served four years in the Coast Guard. My last station was a cutter out of Miami and one of our routine assignments was a patrol around the Cay Sal Banks. It was for arms and drug interdiction and primarily, at that time, it was to look for and pick up refugees who had left Cuba by various means. We picked'em up in boats and home made rafts, some made out of inner tubes. When we found'em, we took'em to Key West, or, if there were a lot of'em, to Miami, ... not back to Cuba. The most perplexing thing is that some Haitians are prefering to risk their lives trying to get out of their country by raft rather than simply try to cross the border by land to Dominicana because of how hostile the dominican goverment has become to haitian inmigration even forms that where until recently, legal. Today even the sons of haitians that were born in Dominicana (and therefore legal citizens) and that have decades living in the country can face deportation or be denied acces to their legal documents in case they need a copy or renovation.